On August 23, 2007, user Chris Messina used the first hashtag on Twitter #Barcamp. Today, an average of 125 million hashtags are tweeted per day. SAN FRANCISCO: When the hashtag was first conceived on Twitter 10 years ago, brands were merely using it to punctuate content. Today, if a brand creates a hashtag, it is used in all media and formats as an integral part of a comms and marketing strategy. "We see brands of all categories and industries using hashtags," said Twitter’s head of global brand strategy, Alex Josephson. "The hashtag has been a gateway for Twitter to become an integral part of a comms plan, versus just an add-on thing you throw on a tweet when you publish it." Josephson explained that brands continue to innovate how they use hashtags, but several clear lessons and tips have come out of hashtag usage over the past decade. The first, says Josephson, is that brands must be true to their values with every hashtag they use. "Credibly participate in conversations and have an opinion on topics where you have a right to speak on a specific topic," he says. "Consumers already identify with your brand in a certain way." Brands should also keep in mind that hashtags no longer live and die on Twitter. Tweets and hashtags show up on TV, in a press release or newspaper, or as part of experiential advertising and marketing. Hashtags can also be used as a call to action, and are an "effective method of rallying consumers on your behalf around a particular topic or initiative," said Josephson. He warned, however, that brands should look at a hashtag from every angle before publishing. If used correctly, hashtags can form a new channel of conversation for a brand. Charmin, for instance, has done this with its quirky #TweetFromTheSeat hashtag, built off the insight that people use social media while they are in the bathroom, Josephson explained. "While there is a lot of thought from brands about what conversations they have a right to play, when it comes to tweeting from the seat, this is Charmin’s domain," he said. "It has resulted in a lot of hilarious content users and consumers have generated and #TweetFromTheSeat is now an ownable property for them. It is in their tongue-in-cheek brand voice; they don’t take themselves too seriously." Another brand that has used hashtags in a noteworthy way, said Josephson, is Coca-Cola, which become the first brand, back in 2015, to pay for an emoji on Twitter, with a picture of two Coke bottles clinking appearing when a user types "#shareacoke." 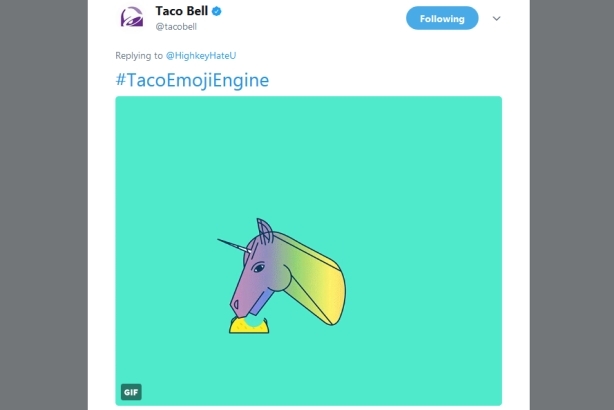 Taco Bell embraced the notion of value exchange with its #TacoEmojiEngine hashtag in 2015. Those who included the hashtag in Twitter posts were gifted with replies that had custom animated gifs. "Brands are gamifying the hashtag and creating unique value exchanges between users using it as the instrument," said Josephson. "So when a user tweets at a brand with a certain hashtag, they are unlocking content or they are unlocking a coupon or they are unlocking an exclusive." On August 23, Twitter is encouraging users to tweet with #Hashtag10 to activate a 24-hour custom emoji to celebrate the 10th birthday of the hashtag. On August 23, 2007, user Chris Messina used the first hashtag on Twitter #Barcamp. But Twitter didn’t actually roll out the hashtag as a platform feature. "We had seen users use the hashtag as a method to organically aggregate a group conversation together in search results on Twitter," said Josephson. "The product team decided to embrace it and make it easier for users to leverage this feature and they turned hashtagged words and phrases into hyperlinks." The most Tweeted hashtag in 2007 was used around 9,000 times. In comparison, the most-used hashtag so far in 2017 was used over 300 million times. And currently, an average of 125 million hashtags are tweeted per day. The most popular hashtags are #FollowFriday or #FF, which have been tweeted over half a billion times; #NowPlaying, which has been Tweeted more than 1 billion times; #ThrowbackThursday and #TBT, with 120 million tweets. Five of the biggest hashtags of the past 10 years stem from fans tweeting while they watch award shows - whether tweeting to vote for an award or live tweeting the event. The most-Tweeted television show hashtag is #TheWalkingDead and the most-used movie hashtag is #StarWars. In terms of sports, the most tweeted global sporting event hashtag is #Euro2016; #SuperBowl takes the crown for most-tweeted sporting event hashtag; #NFL is the most tweeted about league; and #MUFC is the most-tweeted team hashtag.